This rain cloud feed me beginning sounds alphabet game is a fun way for children in preschool or kindergarten to learn letters and the sounds they make! Ever since they were very young, my kids have loved feed the animal activities. 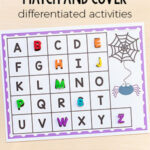 Like that time we did this feed the bear alphabet activity and this super cute feed the turkey counting activity. Apparently, my kids enjoy learning any skill when they get to pretend to feed something. Haha. 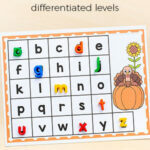 Another great thing about it is that you can differentiate the letters and sounds you work on with each group. 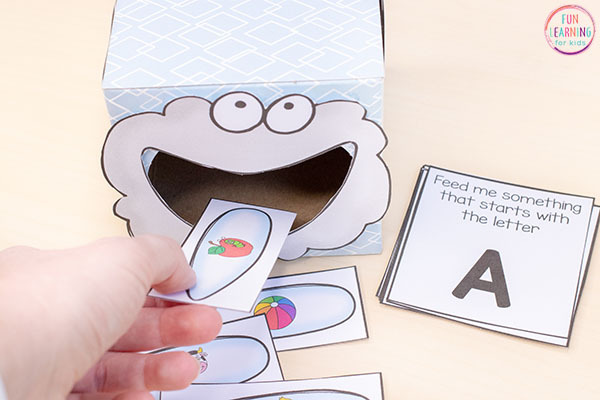 For this feed me activity, students will feed raindrops to the rain cloud. My kids got a kick out of this. There will be raindrop cards laid out on the table. Each raindrop card has a picture of something on it. Each picture starts with a certain letter in the alphabet. Students will pull a letter card from the pile. 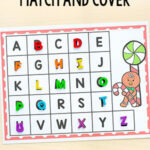 Then they will look for a raindrop card that has a picture of an object that starts with that letter. 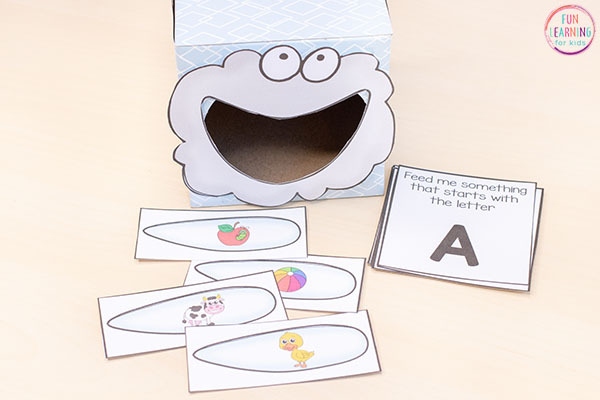 For example, if a students pulls a letter card that says “Feed me something that starts with the letter F,” students will look at the raindrop cards and find the one that has a picture of a fish on it. This is because fish starts with the same sound that F makes. Then they will feed the fish raindrop to the rain cloud. You will probably want to laminate the letter cards, raindrop cards and rain cloud for durability. Once you have the tissue box set up and the cards cut out and laminated, it is ready to be used. 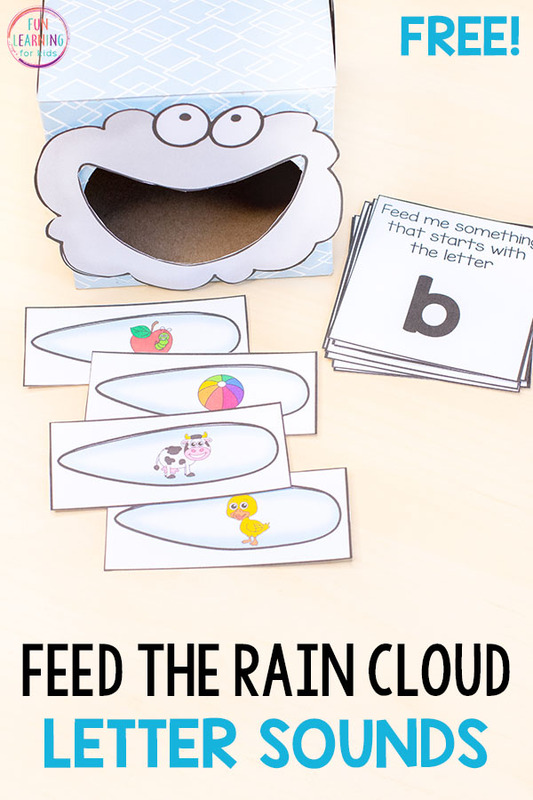 Your students are sure to have a blast feeding the rain cloud while learning beginning sounds! Want more? 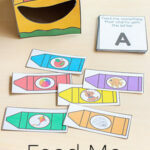 We had a blast with this feed the crayon box beginning sounds activity earlier this year! 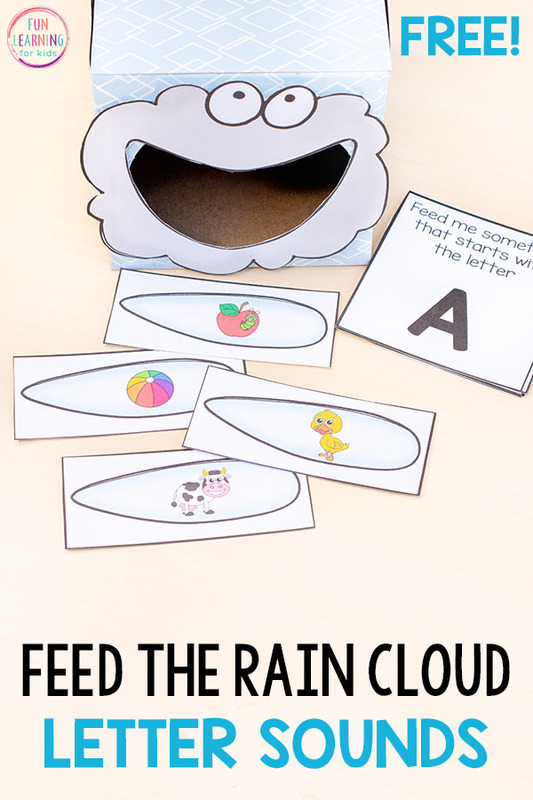 Click the button below to get the Rain Cloud Feed Me Beginning Sounds activity! 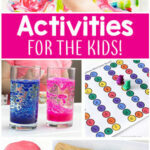 Check out these other fun spring activities!